also performed in the Doug Dillard Expedition during the late 1960s. Roger toured with the Flying Burrito Brothers appearing on their highly acclaimed live recordings, Last of the Red Hot Burritos, and Live in Amsterdam. In 1971, Roger along with Byron Berline founded the seminal bluegrass unit, Country Gazette, recording a wealth of gold-plated music for bluegrass fans beginning with United Artists release in 1972 of A Traitor In Our Midst followed by Don’t Give Up Your Day Job. Roger’s singing, mc work, and buoyant bass slapping have given the needed lift to any ensemble he appears in. 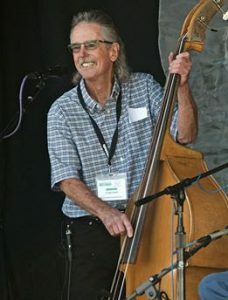 Roger will be with us on Wednesday and Thursday of Camp Bluegrass sharing in the Kentucky Colonels tribute and showing us all how you really are supposed to slap a bass.